The WineKeeper Sonoma's handcrafted wood cabinet creates a tasting room atmosphere while maintaining the perfect temperature for your collection. 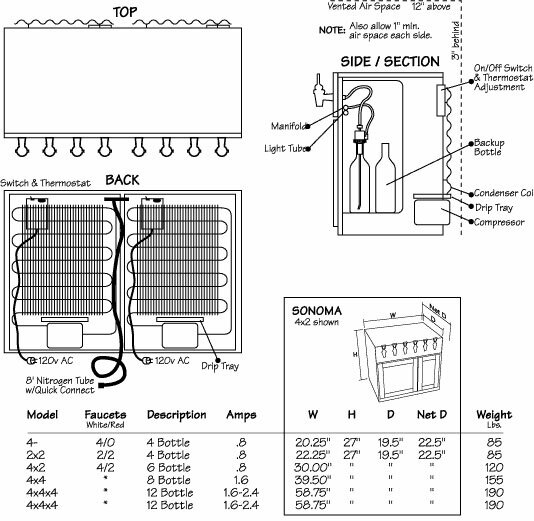 The system maintains a temperature range of 42 - 48° F for white wine, and 46 - 68° F for red, using nitrogen to protect the wine from oxidation and spoiling. The cabinet requires a minimum vented air space of 1" on each side, 3" behind, and 12" above the unit.